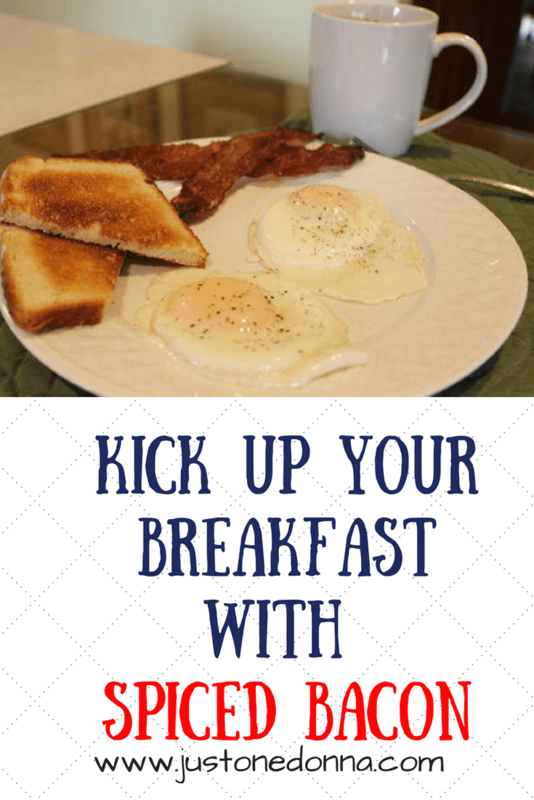 Does your family enjoy an occasional bacon and eggs breakfast? Once in a while, we take the time to have a bacon and eggs breakfast in the Just One Donna house. We're usually all running in different directions in the morning, so having a sit-down breakfast altogether doesn't happen very often. When we do have the time, I sometimes like to kick up the flavor with my spiced bacon. It's very easy to make this bacon. Cook it in the oven on a foil-lined baking sheet topped with baking racks. The foil makes for easy cleanup. It will take about thirty minutes to cook the bacon, so you'll need to plan ahead accordingly. If you like a little spice in your life, you'll enjoy this bacon on your breakfast table. Preheat your oven to 350 degrees F. Line a rimmed baking sheet with aluminum foil for easy cleanup. Top the aluminum foil with baking racks. In a small bowl, mix together the brown sugar, chili powder, and cumin. Pour the mixture onto a plate. Dip each slice of bacon into the mixture coating both sides of the bacon well. Place the coated bacon on the rack in the baking pan. Cook the bacon on the center rack of your oven for about 30 minutes, or until well-browned and crisp. The time will vary based on the thickness of your bacon, so start checking it after about 25 minutes. Cool the bacon on the rack and serve with your favorite eggs. I think this bacon is perfect with a traditional bacon and eggs breakfast. Would you like to know how I make my eggs? 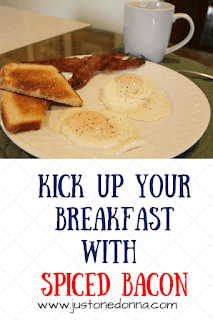 Click the link for my Perfect Bacon and Eggs Breakfast post. Spiced bacon makes a yummy appetizer when wrapped around breadsticks. Read about my Spiced Bacon Appetizers. Check out other yummy recipes on Meal Plan Monday. Oh my goodness, I've never thought of flavoring bacon. I can't wait to give it a try! Pinning now, thanks for sharing your recipe.